For businesses located in the most inhospitable terrain or where weather is often an issue, it’s important to find a unique reason to visit, and the best – like Wall Drug – do it to perfection. A good gimmick is the original social media – you tell your friend, he tells his friend, and sooner or later you end up with 50,000 silver dollars covering the walls of your bar. But, I’m getting ahead of myself. 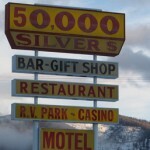 But today the location is known as the $50,000 Silver Dollar Bar, and you can now simply hand over a dollar bill and you receive a commemorative postcard with your “number,” and your name will appear next to your coin when it is finally displayed. As of our visit, there were more than $63,000 worth of silver dollars along the walls, and the bartender (a barely-legal fourth generation Lincoln) explained that they were a few months behind on getting the new boards created. If you’re ever in the region, stop by for a beer and ask where you might find our silver dollars displayed – they’ll point them out for you.